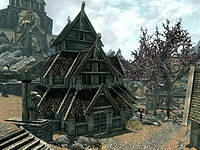 Temple of Kynareth is a small temple in Whiterun devoted to the goddess Kynareth. Danica Pure-Spring and Acolyte Jenssen are tending the wounded in the main room. Danica explains that the war between the Imperials and Stormcloaks is overwhelming her with wounded, so she has been neglecting her priestess duties in order to heal them. Apparently one of her duties was to tend the Gildergreen (the large tree outside). When asked about the tree, she offers the quest The Blessings of Nature. * This person only appears once you have retrieved Nettlebane. 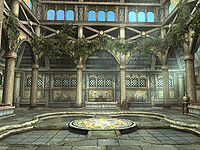 It is located in the wind district of Whiterun. There are several lavender bushes around the area and some stone benches to the southwest and around the Gildergreen to the southeast. The main doors open into the square where the Gildergreen is. There are two entrances into the temple, the main entrance is over a small bridge to the southeast and the other is from the southwest. Around the outside of the central room are a series of wooden benches with three owned healing altars around a tiled central area with a large raised cross mosaic in the floor and shallow water filling the areas between the legs of the cross. The healing altars are to the southwest with a wounded soldier, northwest and northeast with a sickly farmer. The sick and injured are treated and prayed over by Danica Pure-Spring and Acolyte Jenssen. There are a couple of health potions, a plate and a bunch of lavender to the right of the northwest healing altar. There are six planters around the room each holding two lavender bushes. In the middle of the northwest wall is a narrow table with a Shrine of Kynareth on top. To the southwest there are two semi-partitioned areas separated by the entrance, one with a wooden bench, the other a small bedroom with a single owned bed used by Acolyte Jenssen and a narrow table with a level locked strongbox underneath and a goblet, a plate, a loaf of bread and an eidar cheese wedge on top. To the northeast is another semi-partitioned area with an owned single bed used by Danica Pure-Spring, with an end table beside it. On the end table is a bowl and goblet. Along the northeast wall is a small wardrobe with more bowls, goblets and a plate on top, with a bookcase beside it holding various strength healing potions, a jug, thirteen common books and a copy of the Restoration skill book Withershins. Opposite the bed is a table with a small coin purse, a plate, a goblet, some common books, and various healing and health potions. Activating the Shrine of Kynareth cures all diseases, bestows the Blessing of Kynareth for 8 hours, and removes any other shrine blessing. A copy of the Restoration skill book Withershins can be found in the northeast room on the bookshelf.